Disclosure: I received the following Optimus Prime Transformers Beast Hunters review product in exchange for my honest review. Transformers have been one of the most popular brands and toys for many years now. Heck, the boyfriend even still fondly talks about them from his childhood. So, when I was given the opportunity to review one of the new Transformers Beast Hunters toys, I just couldn’t say no! I unfortunately had never even heard of Transformers until my 20’s thanks to the boyfriend, but I think I even would have had fun playing with them as a kid as I was more of a tomboy that loved playing with blocks, cars and Lego’s versus Barbies and other dolls. The boyfriend was totally into Transformers as a kid though and as I said earlier, still talks fondly of the shows and toys. It was fun seeing the kid’s face in him light up when he opened the package and of course immediately had to start putting it together. The first thing he commented on was how the toys are now made out of plastic instead of metal, but that seems to be the case with almost all toys now, doesn’t it? It was actually rather amusing trying to watch him transform Optimus Prime into his automobile form. We both laughed that when the boyfriend was a kid and his father had bought him one of the Transformers toys, his father had a really tough time transforming the toy while the boyfriend was able to do it in seconds. Now with the boyfriend being an adult, he was also having trouble transforming the toy, which I got a kick out of. The toys are for kids age 5+ and are at level 2 ( intermediate), so some help may be needed. There are instructions included, but I honestly found them kind of confusing and thought that it was easier to play with by moving the parts intuitively. Most of the parts snap and click as you move them around and “lock” them for the various positions. We were worried about breaking the toy since it was plastic, but in our experience even though a couple parts came off as we were playing around with it, they easily snapped right back on. I also like that Optimus Prime comes with weapons that you can attach, though I forgot to put them on for the photo. Final Takeaway: We both enjoyed a blast from the past in playing with Optimus Prime from the Transformers Beast Hunters collection. I think that at around $20 each, they are a fun and affordable toy for kids both young and young at heart. Win It: Congrats to our giveaway winner, Paula L.! Disclosure: I received the product reviewed above in exchange for my honest review. Money Savvy Michelle cannot be held responsible for any prizes or shipments in this giveaway. Hasbro is the sponsor and is responsible for all prizes and shipments. 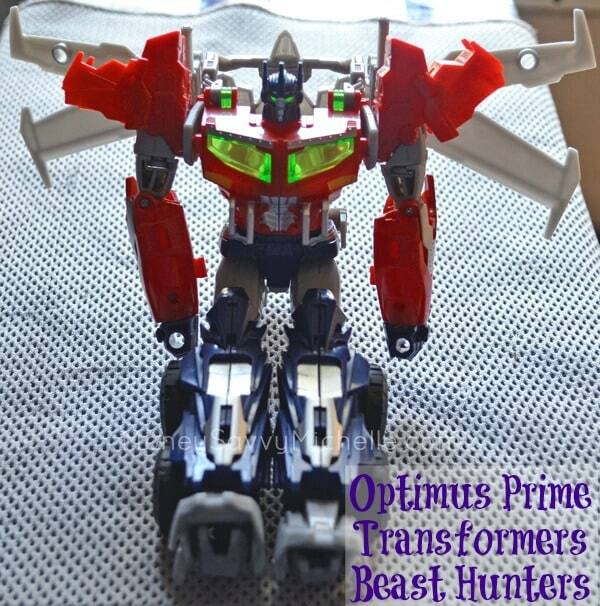 I hope you enjoyed this Optimus Prime Transformers Beast Hunters Review – be sure to check out our other reviews!